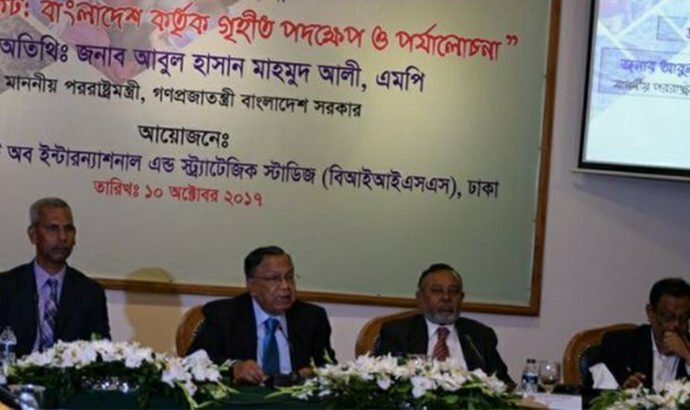 The minister was speaking at a roundtable discussion at Bangladesh Institute of International and Strategic Studies on Tuesday morning. He said it would be difficult for Bangladesh to send back the Rohingya, who have fled the violent “ethnic cleansing” in Rakhine that began once again on August 25, to Myanmar without support from international community. Minister Mahmood Ali noted that the Myanmar army was strengthening their forces in Rakhine about a month before August 25. On the Myanmar’s home minister’s plan for “demographic balance,” Mahmood said the Myanmar army was working with Buddhist extremists to execute their plan. “It is quite noticeable that the Myanmar government is trying to sow confusion among the international community and their own citizens by promoting false news in their state-run media. “They are trying to establish this issue as ‘Islamic terrorism’ or ‘extremist Bangali terrorism’. Their campaign plans to confuse their neighbours.